I've been meaning to refute Ben Shapiro for months now and just haven't gotten around to it. I've only heard of him from within the past year but I've since learned he's been making ignorant utterances publicly for more than a decade. Ben is an orthodox practicing Jew, and a pretty conservative one at that. He defends religion and belief in god quite often, usually while he's attacking atheism, and when he does so he can always be counted on to make a fool of himself. This is based on the fallacy that souls can give us free will. 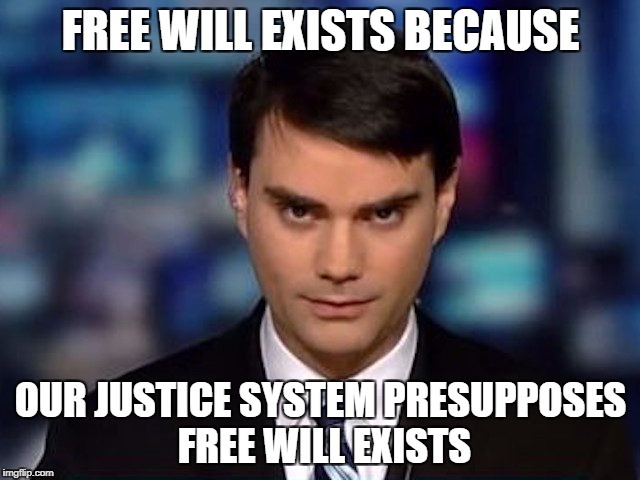 Whether or not we have a soul is irrelevant to whether we have free will, and that's because the concept of libertarian free will (which is what Ben really means when he says free will) is completely incoherent. This has not trickled down into the masses yet, even though almost 90% of philosophers know this. Thats because a Godless world is a soulless world. Virtually all faiths hold that God endows human beings with the unique ability to choose their actions -- the ability to transcend biology and environment in order to do good. Transcending biology and our environment requires a higher power -- a spark of the supernatural. But where does your soul inherit its traits? Don't souls bare some resemblance to your parent's souls? If not, what gives your soul its apparently unique characteristics if they aren't inherited from biology at all? Are people born with a soul that is a particular way? If so, then how do you transcend the tendencies of the soul you had no choice to receive? It's the same problem Ben thinks the body has with biology: if we inherit our biology without a choice and can only transcend it with a soul, then if we inherit our soul without a choice how can we transcend that? The answer can't be free will, because clearly our souls don't have all the same capabilities. Gilbert Pyle, the atheistic philosopher, derogatorily labeled the idea of soul/body dualism, the ghost in the machine. Nonetheless, our entire legal and moral system is based on the ghost in the machine -- the presupposition that we can choose to do otherwise. We can only condemn or praise individuals if they are responsible for their actions. We dont jail squirrels for garden theft or dogs for assaulting cats -- they arent responsible for their actions. But we routinely lock up kleptomaniacs and violent felons. The Cartesian style dualism commonly referred to as a ghost in the machine prejortively, makes scientific claims that have absolutely no basis in science. In fact, this is one of those things science has unambiguously refuted. (See here too) And you can't say free will is true or that we have a soul because our legal system is based on it. The legal system assumes free will is true and can easily operate under false assumptions. That's one of the reasons why it's so bad. Legal responsibility on no free will is more complex and nuanced. It's generally based on a quarantine model for those who are dangerous and deterrance against future law breakers with an emphasis on reform instead of punishment in prison. No libertarian free will is required for that. Its not only our criminal justice system that presupposes a Creator. Its our entire notion of freedom and equality. We hold these truths to be self-evident, wrote Thomas Jefferson, supposed atheist, that all men are created equal, that they are endowed by their Creator with certain unalienable Rights, that among these are Life, Liberty and the pursuit of Happiness. Human equality must spring from a Creator, because the presence of a soul is all that makes man human and equal. Jefferson was a deist, not an atheist, and he had harsh words for the god of theistic religions, like Christianity. Souls don't make man human or equal. If you're naturally inclined to be better at math, it's because your soul is naturally inclined to be better at math. So even if we had souls, our souls would clearly not be equal, lest we'd all have the same exact personality and mental abilities. This idea that souls make mankind human, is false too. It's based on the antiquated idea that the soul makes us able to think rationally, but that's false. Our brains make us think rationally, and no soul is needed for it. As such, souls don't make us anything. A person without a soul would be indistinguishable from a person with one. Biology suggests the sort of Hegelian social Darwinism embraced by totalitarian dictators, not the principles of equality articulated by the Founding Fathers. Actually the kind of free market libertarianism Ben is so fond of is what best encapsulates social Darwinism. Without a soul, freedom too is impossible -- we are all slaves to our biology. On Ben's view, we are all just slaves to our souls — which we didn't choose. If your soul is mentally quicker than mine, you have an advantage. According to atheists, human beings are intensely complex machines. Our actions are determined by our genetics and our environment. According to atheists, if we could somehow determine all the constituent material parts of the universe, we would be able to predict all human action, down to the exact moment at which Vice President-elect Joe Biden will pick his nose. Freedom is generically defined as the power to determine action without restraint (Random House). But if action without restraint is impossible, how can we fight for freedom? No one can break free from the laws of physics, which determine us all, whether we like it or not. What Ben is suggesting humans do is break the laws of physics whenever we make a choice. That simply doesn't happen. If you think you can break the laws of physics, go to CERN in Geneva and have the world's top scientists verify it. We can easily fight for freedom in a world with no free will because what we'd be fighting to change are governmental, corporate, and authortarian restrictions on people's behavior; we're not fighting to be free to break the laws of physics. And we don't know what will happen in the future, that's why it makes sense to convince people to behave certain ways. If there is no God, there is no freedom to choose. If there is no freedom to choose, there is no good or evil. There is merely action and inaction. There is no way to be good for goodness sake -- that would require an act of voluntary will far beyond human capacity. Even if there is a god there is no free will because the concept itself is incoherent. Good and evil can have coherent definitions without the presupposition of free will, and nothing about the laws of physics — which determine all human action — preclude good for goodness sake. So Ben is wrong here on all accounts. Atheists simply gloss over this point. The American Humanist Association states on its website, whybelieveinagod.org, We can have ethics and values based on our built-in drives toward a moral life. Without a soul, this is wishful thinking of the highest order. Since when does biology dictate a moral drive? If it did, wouldnt man always get more rather than less moral -- wouldnt history be a long upward climb? What about the murderers, rapists, child molesters and genocidal dictators? Are they all ignoring that built-in drive toward a moral life? What the American Humanist Association means by "built-in drives toward a moral life" is the innate built-in capacity that most of us have. There are, of course, exceptions, like genocidal dictators, who we should deter and defeat so that the rest of us can drive forward with ethics and values. Overall, humans do get more moral in general. We don't have as much war and death as we did one, or two, or three thousand years ago. We don't stone to death people who worship different gods like Ben's ancestors did in ancient Israel. It's funny how a conservative Jew like Ben can have the balls to claim we are endowed by god inalienable rights when his religion — if practiced more literally the way it was 3,000 years ago — would be an affront to human rights. It would be the kind of society ISIS wants to live in. Atheism may work for individuals. There are moral atheists and there are immoral religious people. But as a system of thought, atheism cannot be the basis for any functional state. If we wish to protect freedom and equality, we must understand the value of recognizing God. We must recognize the flame of divinity -- free will -- He implanted within each of us. Atheism is generally not being offered as the basis for any state by atheists. Most Western atheists are secularists, they are not pushing for state atheism. Only people who don't know better conflate the two. Atheism is also about what you aren't, it's not about what you are. A state should be based on what you are. The Western world, particularly Western Europe, is already basically godless, and it is not falling apart. The least religious countries are often the most safest, and the most religious countries are often the most violent. The claim that atheism leads to the collapse of moral decency or of society in general is demonstrably false from the data. Many people point to the Soviet Union as an example of atheism ruining a society. The problem with the Soviet Union was communism and dictatorship, not atheism. You cannot have a country where one person has absolute power because if a psychopath becomes king or dictator, they will mass slaughter thousands or millions. Just look at one example of a theistic dictator's trail of dead. Conclusion: To be fair, religious knowledge is not Ben's forte, which is why it's so unbelievably easy to refute him on the subject of religion and atheism. Future posts rebutting him will take on his more political and social leanings, which he's primarily known for. *There is missing puctuation in all of the quotes from the site. I just left it as is without noting any errors. Can Metaphysical Claims Be Falsified By Science?